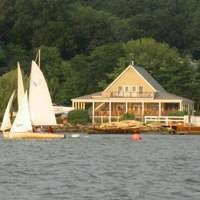 The Cayuga and Seneca Lake Canal runs about 12 miles from Seneca Lake to Cayuga Lake in Upstate New York about 40 miles southeast of Rochester and 38 miles southwest of Syracuse. The waterway connects the Erie Canal with upstate New Yorks Finger Lake Region. Pictured above is the canals southern terminus at the northern end of Seneca Lake. The Cayuga and Seneca Canal empties into Seneca Lake south of Seneca Lake State Park in the upper northwest portion of the lake. 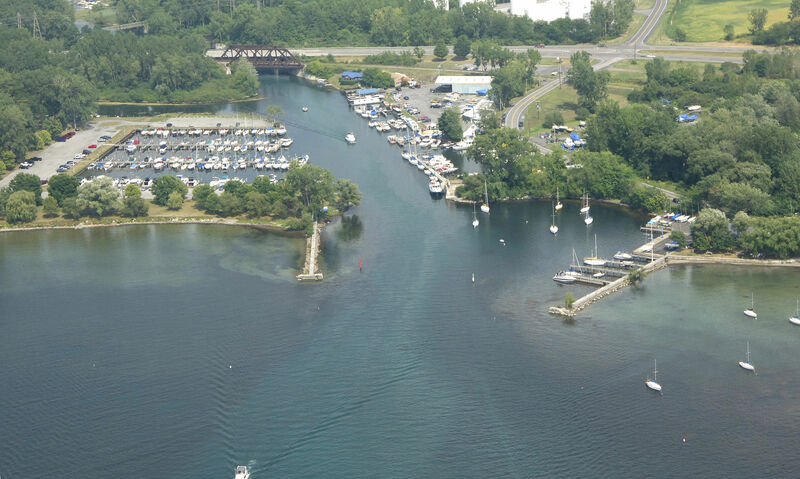 At the terminus of the canal is a busy mix of marinas and five fixed bridges within a one-mile stretch. The minimum vertical clearance of all five bridges is 17 feet. 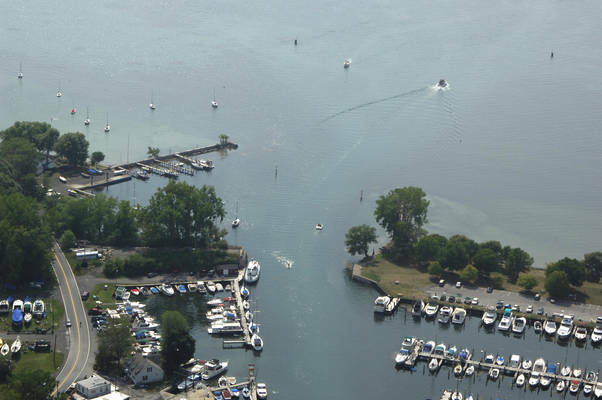 From Seneca Lake, set a course for flashing green buoy 135 and flashing red buoy 136 about two-tenths of a statute mile from the breakwatered entrance to the canal. Once you have cleared these markers, set your sights on flashing green 133 and flashing red 134 just inside the inlet breakwaters. (These two markers are visible in the image above.) 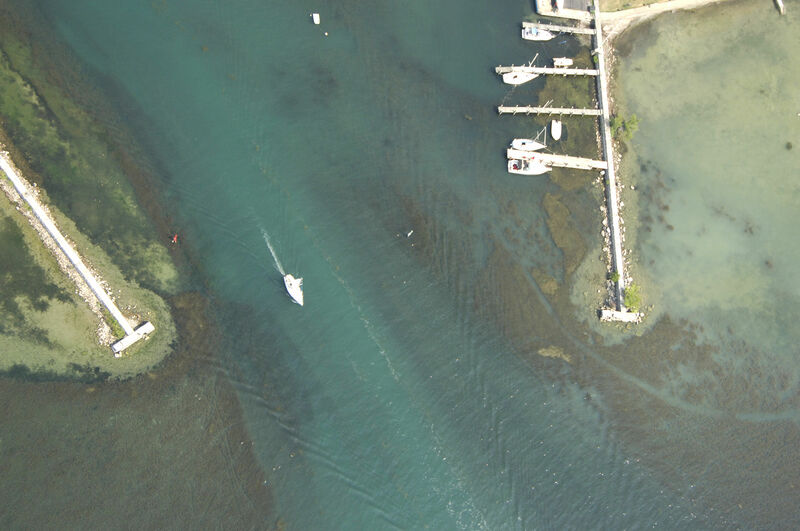 Having cleared the inlet, you need only stay in the middle of the canal for the rest of your journey, but be aware that five fixed bridges (minimum 17-foot vertical clearances) cross the water just ahead. Locks and flood gates follow on your way to the Erie Canal. 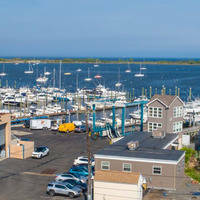 Inside the protected inlet are three marinas. 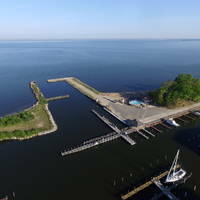 Two of the marinas have limited transient slips (one a yacht club with reciprocal privileges) and the other is the Seneca Lake State Park Marina (to the left in the image above), which makes as many transient slips as possible available for visiting mariners. No reviews yet! Be the first to write a review of Cayuga Seneca Canal Inlet.